The evidence continues to pour in. Eating meals with family is good for kids health. In 2010 a study of nearly 9,000 4 year-old children published in the journal Pediatrics concluded (in part) that young children who regularly at the evening meal as a family had a significantly lower prevalence of obesity. Other studies published in the journal Obesity have supported the idea that teenagers who eat with their family are less likely to be obese at baseline. Now a new study in the January issue of Child Development looks not only at the act of sitting with family but the effect of having quality interactions and conversations together. Children who had positive communication during mealtimes had less severe asthma symptoms and an improved quality of life. More work has shown frequent family meals were significantly associated with a lower likelihood of adolescent alcohol and tobacco use. Most recently in the Journal of Health Psychology May 2010 issue teens’ experience at the mealtimes was found to be connected with this decreased rate of substance use. Looking at all of this evidence makes it very clear. We need to eat dinner with our kids for the sake of their health. We need to cultivate ways to make our dinnertime conversations meaningful, interesting, thought-provoking. Sure, some of the research shows a benefit to simply sitting around the table together but, you might as well have fun while you sit there. Look around this blog for ideas to take to your table. Help me generate more. Stick with me to find your own family voice. As a final note or perhaps, a first step: hold back the worry about what and how much your child eats! 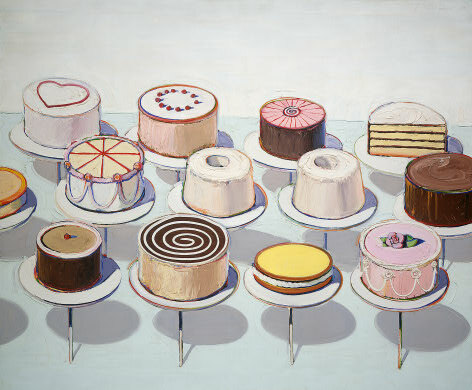 As a parent your job is to offer healthy food choices (The Thiebaud cakes here are just for fun) , their job is choose which foods and how much to eat. Think of their nutrition as averaged over a month; if the choices are healthy then eventually their diet will become well-rounded. Given this – let’s focus on the experience of developing lively mealtime conversations.